Botanical nomenclature identifies the plant as Lysimachia punctata 'Alexander.' It is sometimes commonly called "variegated yellow loosestrife." For the origins of these names, including the cultivar name, 'Alexander,' see below. It is classified as an herbaceous perennial. 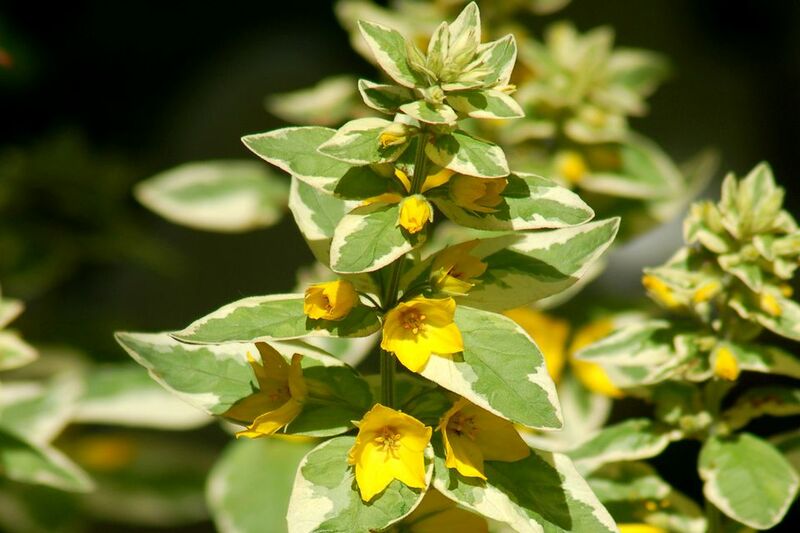 Lysimachia punctata 'Alexander' reaches a height of 1 to 2 feet at maturity; its spread is slightly less than that. It blooms in zone 5 in June, the flowers being yellow. But its variegated leaves, which grow in whorls, mean just as much to us as its yellow flowers. At blooming time, the variegation is green and white, but earlier in the spring, it is a more striking green and pink. This clump-forming perennial is listed for planting zones 4 through 8. Treat it as a full-sun plant in the North; in the South, it will do better in partial shade. It needs to have its soil kept moist and is even a good plant for wet areas. The ground should, nonetheless, drain well. Improve the soil by working humus into it. Yes and no. In our experience, it's not invasive in the North. But some who garden in warmer climates do report some invasiveness. Let's make a clear distinction, though, between the cultivar and its parent (i.e., the species plant). The species plant, non-variegated Lysimachia punctata, is indigenous to Europe; its common name is "spotted loosestrife." This is the plant you're thinking of if you're saying to yourself, "We know we've read somewhere that yellow loosestrife is invasive." Spotted loosestrife does, indeed, spread vigorously via rhizomes. But the cultivar—even though it, too is rhizomatous—isn't as vigorous and is unlikely to be especially invasive in the North. Still, it's possible that under ideal conditions (namely, full sun and wet ground) it might spread more than you'd like. If you're mildly apprehensive, hem it in with bamboo-style barriers. If you're severely apprehensive, abstain from growing it all together. There is plenty of fish in the sea (meaning, in this case, "safe" plants to grow). Lysimachia derives from Lysimachus, who was a Macedonian king who lived from 361 to 281 B.C. The Latin, punctata means marked or "punctuated" (with spots). 'Alexander' refers to a Mrs. Alexander, who gave the world this cultivar. We learned this last point from Paghat (Jessica Amanda Salmonson), who also explains the origin of the common name, "loosestrife," stating that it's "from an old superstition that it loosens or negates the anger or strife of wild beasts." Paghat observes that the above-mentioned King Lysimachus was said to have calmed a leopard using a branch of loosestrife. Along the same lines, she also cites herbalist, John Gerard as having noted that farmers, while plowing their fields with oxen, would tie sprigs of loosestrife to the yokes to keep the oxen calm, thus facilitating the hard work of tilling the land. Gooseneck loosestrife (Lysimachia clethroides) and purple-leaved loosestrife (Lysimachia ciliata 'Purpurea') are common aggressive plants. Lysimachia vulgaris is variously called "common," "garden," or "yellow" loosestrife. Creeping jenny (Lysimachia nummularia) is a very different-looking plant from the upright plants mentioned previously. It's a vine commonly used as a ground cover. Many people, when they hear "loosestrife," automatically think of purple loosestrife, a notoriously invasive plant. Purple loosestrife, however, is actually not a Lysimachia at all. Its botanical name is Lythrum salicaria. And if that isn't enough to make your head spin, this fact may succeed in doing so: the genus, Lysimachia is in the primrose family, while the genus, Lythrum belongs to what is known as the "loosestrife" family (for those not familiar with botanical classification, a species is subsumed under a genus, and a genus is subsumed under a family). All of which argues the case for using botanical or "scientific" plant names: common names lead to excessive confusion. Is Sweet Autumn Clematis Really So Sweet? Do You Have a Secret Lust?